Aaux Next is an all around geometric type family created by Neil Summerour and published by Positype. Designed as a followup for the 2002 Aaux, Aaux Next was born with the intent to offer more versatility and to expand the already popular family. With each glyph redrawn from scratch with a simple architecture, Aaux Next now has an enormous 72 typefaces, from compressed to wide. Aaux Next could be you next workhorse! 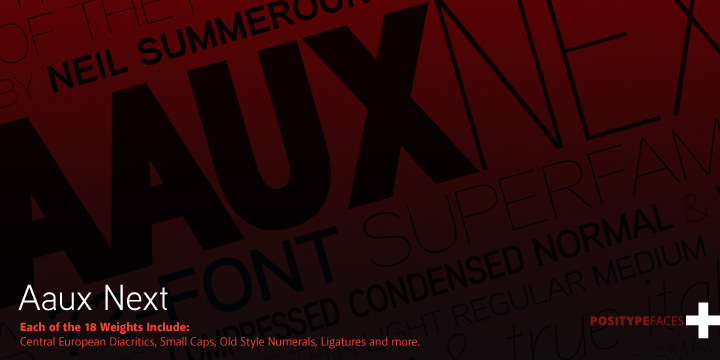 Trademark: ‘Aaux Next’ is a registered trademark font name of Positype. A font description published on Friday, March 27th, 2015 in Fonts, Neil Summerour, Positype, Typesketchbook by Andrei that has 7,046 views.